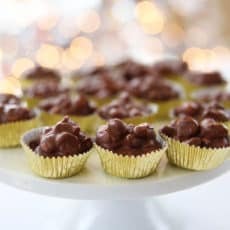 I have made this crock pot candy for a couple of years now. 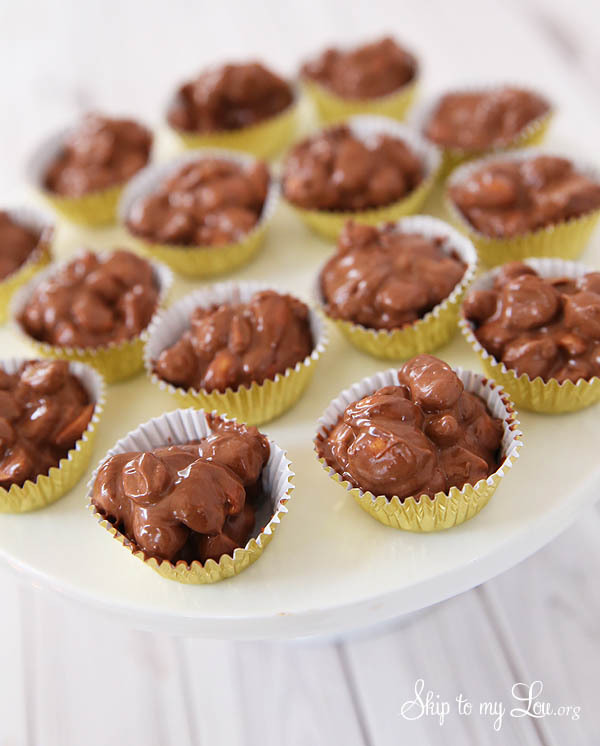 It is easy and makes the most delicious peanut clusters. 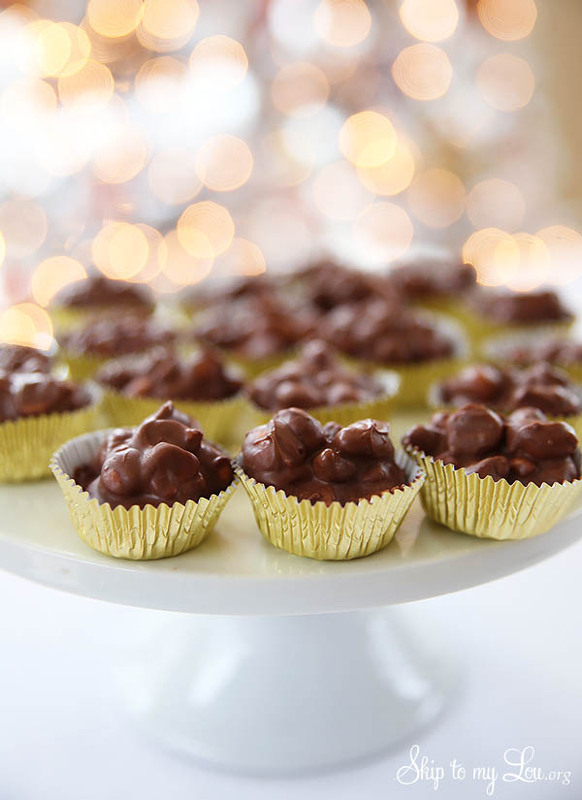 It is an easy candy recipe for your slow cooker! I know you will love this Crockpot candy. It makes a ton perfect for gift giving. 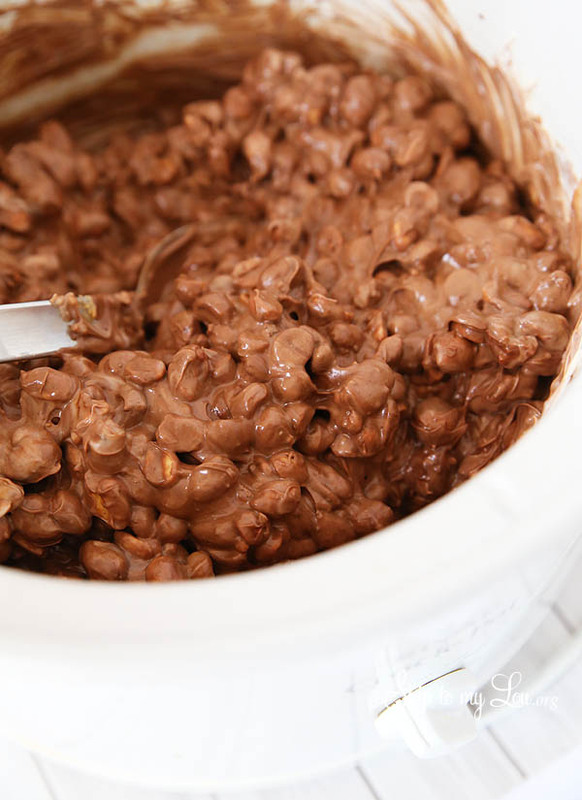 This CrockPot candy is adapted from a recipe found online called Mr. Bud Candy. I see that Tricia Yearwood also has a version of this delicious candy. During the busy holiday season, the crock pot can make easy snacks and meals. From Crock Pot Chex Mix to perfect Crock Pot Baked Potatoes the crockpot will keep your family well fed. I love these unique crock pot recipes. I am also a huge fan of the Instant Pot. Check out my Instant Pot Recipes. It is really important to purchase high quality melting chocolate. I personally feel Almond Bark has too much wax and I am not a fan of the flavor of Wilton brand candy coating. An easy candy recipe for your slow cooker! Place ingredients into a 4 or 5-quart crockpot in EXACT order as listed. This recipe is made best by following the recipe ingredients! Cover and cook on LOWEST setting for 3 hours. I cook my candy for 1 hour on low setting and then on the warm setting for 2 hours. DO NOT remove lid! The mixture will not be melted but will be soft. Mix thoroughly. Scoop candy onto wax paper or place into candy cups. Let cool thoroughly. Makes approximately 125 pieces. How do you make crock pot candy? Scoop candy onto baking sheets lined with parchment paper (or wax paper ) or place into candy cups. Let cool thoroughly. Makes approximately 125 pieces. This candy recipe makes a ton so it is perfect for holiday parties. Not all crock pots and slow cookers are created equal. Slow cookers can actually cook hotter and burn the candy. Be sure to choose the lowest setting. If your crockpot is below 275 watts (look at the bottom of the crockpot for wattage), you should not have any problem with the candy burning if you follow the ingredients and the directions. Candy should not smell like it is burning. 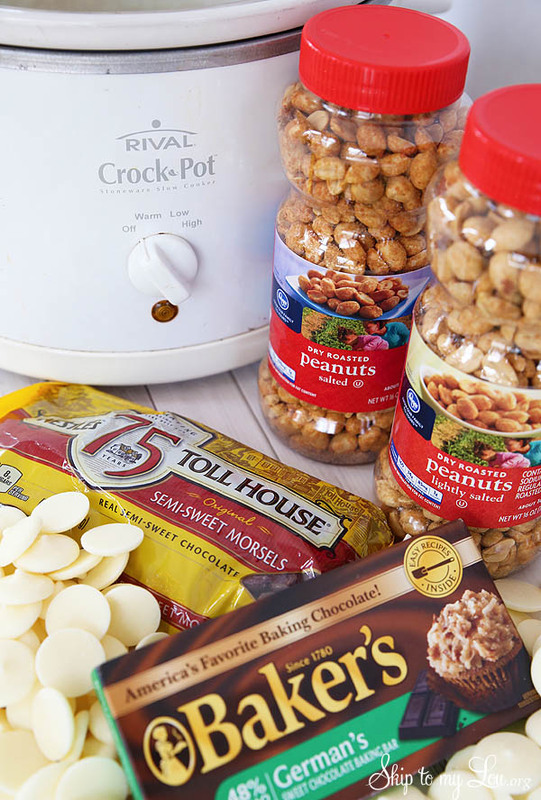 Now you know how to make peanut clusters in a crock pot. I hope you love this crockpot candy! For another great treat try these peanut butter corn chip cookies! They are a great no-bake recipe. If you have a friend with allergies but would like to gift them a sweet treat try these homemade peppermint patties. They are dairy free and gluten free! I have a batch going right now to share with family for Thanksgiving (since we don't all get together at Christmas). Thanks for sharing your recipe with us! Can you tell me where you buy your candy cups? I bought some on Amazon - but they don't hold their shape like yours seem to. Help? You can get them from sweetbakingsupply.com. The foil cups hold their shape better. Yes Joannie, but super slow. I might set the crock pot to warm and reheat very slowly so the candy doesn't burn. Can you use any nut? I'm not partial to peanuts but pecans, walnuts, hazelnts could be broken into small pieces - would that be ok? could you also add caramel? Anne, I think it would be delicious with any nuts! Why do you cook it for 4 hours are just to melt candy? Hi Linda, it helps to meld all the flavors... and be careful it cooks for 3 hours. I do 1 hour on low and 2 hours on warm. Cooking melting chocolate low and slow also helps it to remain shiny once it is cool and hard again. we quickly decided that this candy is a MUST! So we've added it to our "baking" list! I'm with Mary, when it comes to adding the white chocolate. Have you tried different variety's? More dark chocolate, Raisins would be good in too, kind of like those big square candy bars, It's to early to think of the name! And getting older and more forgetful doesn't help! Ah ha The candy bar is called Chunky! Laurel, I haven't tried these additions. I think you could use white chocolate instead of the candy coating. Candy coating does help to make the candy remain smooth and shiny once cool and hardened. When melted low and slow it also helps release from candy molds or candy cups. Peggy - You melted the WAX!! your chocolate was probably really hot -- I prefer to use parchment paper for cookie and candy making -- all purpose, can line baking sheets to make cookies, etc. nothing sticks to it. Stephanie - I'll bet it would be easy to make this in a 'double boiler' if you have one, or you can make one yourself using saucepans. a couple of inches of water simmering (NOT boiling) in a larger bottom one, a smaller one sitting atop the larger one, NOT in the water. put chocolate in top, leave until it looks the melty consistency you want. Be careful not to get water, steam or steam droplets into the chocolate - it will 'seize up' or harden instantly. you can remelt with a teaspoon or so of shortening if that happens. I don't have the option to set my crockpot to "warm." It only goes on warm when the time setting is up. I guess I could just unplug it & let it sit? Any suggestions? Yes, Stephanie. I would unplug and let it finish melting and give it a stir. I think this recipe is very forgiving if you error on the side of using low heat! I wondering why dry roasted and not regular peanuts and why the almond bark. Seems like it would make them way too sweet. I like to make my cluster with just semi sweet choc chips but was going to try to put in some bakers chocolate to tone down the sweetness just a little making them more dark chocolate which is healthier for one.! Love the idea and the recipe though! Will have to give it a try someday! Mary, if you make those changes let us know how it goes! I made some of this a week or so ago. I like your idea of using the candy cups. I just dropped mine onto waxed paper on the counter. There must have been super glue on the other side of the paper! Some of them were really hard to pry off the counter!